Haxton Instruments » David Haxton, Seattle Luthier specializing in guitar building and guitar, mandolin and banjo repairs. Designed and built in Seattle with the fabulous vintage instruments of the 30’s to the 50’s in mind, David Haxton is making some of the most playable, best-sounding guitars available today. These guitars incorporate all the best design & construction features of the vintage era while adding subtle refinements to improve the playability and sound. Suprisingly affordable for Luthier-built guitars of this quality, stop by the How To Buy page to check out their availability and price. Greg Boyd Music is currently carrying Haxton guitars; please check them out at gregboyd.com. 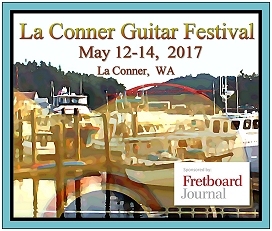 Haxton Instruments will exhibit several guitars at La Conner Guitar Festival May 12-14, 2017. Please stop by our booth!